Most species of thatching ants are bi-colored red and black. A few are all black. 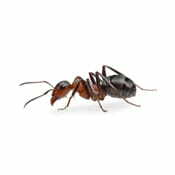 They are medium to large ants, averaging from 4–8mm (3/16–5/16 inch) long, with a notch or depression on the top of the thorax when viewed from the side. They are polymorphic, that is, the workers vary in size within the same colony. Their reproductive swarms (winged males and queens leaving the colony) occur in late summer to early fall. Thatching ants are sometimes referred to as “mound” ants because some species construct mounds from small sticks, grass stems, leaves, and pine or fir needles. They may also nest in decayed logs. Under most circumstances, thatching ants should be considered beneficial, since they are fierce predators of other insects. However, where they occur in lawns, rockeries, picnic areas, and other locations of human habitation, they can become a severe annoyance. Additionally, they are often injurious to seedling trees or plants near their nests, and they have been known to damage the buds of apple, pear, and plum in the spring. The landscape can be visually disrupted by the presence of their mounds. Physical contact with them is also displeasing, since they can bite quite hard and usually spray the area they have bitten with formic acid to produce a painful sensation or even blistering if the skin is not washed. Thatching Ants are considered a beneficial insects and rarely infest/invade homes. They can cause problems when they invade a yard or kids play area as they can bite. If they aren’t a problem and no one is getting bite we recommend letting them live.